What Is the Mask They Put on a Horse's Face? Typically, the sometimes mysterious articles that horse owners put on their horses have a practical purpose. 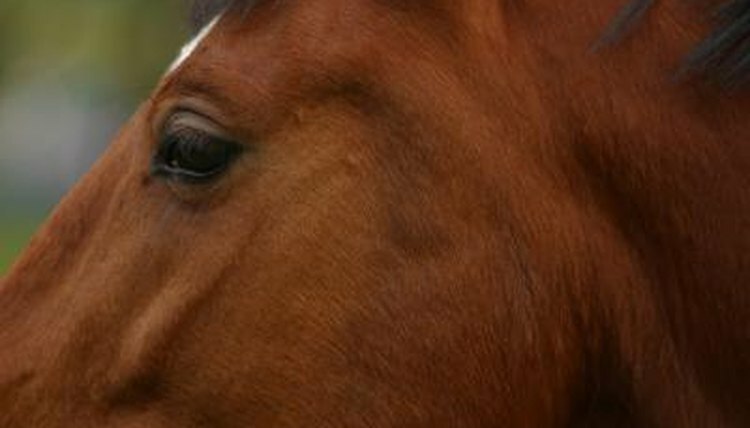 The masks that horses commonly wear in their stalls or pastures seem to obstruct their vision, but they are actually akin to humans looking through a window screen. Once your horse accepts a halter, he will typically accept wearing a mask once he realizes he can see through it. The mask you most likely see on horses is the fly mask. True to its name, these masks protect your horse from pesky flies and other flying insects, like gnats and mosquitoes. It’s not just your horse’s comfort that’s at stake, however; flies and mosquitoes can carry contagious illnesses and diseases, so the fly mask protects your horse as well as others in close proximity. Fly masks offer your horse some protection from low-hanging branches or prickly plants in your horse’s pasture or paddock that could poke his eyes. The masks also protect his eyes from pollen, dust and pieces of hay, which is particularly beneficial if your horse suffers from allergies. Some masks are designed to fit over a bridle so they can be worn during riding, making dusty arenas more comfortable for your horse on dry, windy days. You will find a fly mask useful if your horse gets a cut or abrasion on his face, both to protect it from further injury and also to keep flies off the wound. Veterinarians prescribe fly masks for horses recovering from eye surgery, such as cataract removal, or medical conditions in which the eyes are sensitive to light, either temporarily or permanently. There are also specialized masks that offer greater eye protection with a molded eye cup, designed specifically for eye injury protection. Don’t confuse fly masks with the gear you see horses wear in competitions like racing or polo. Race horses wear cheek pieces called blinders or blinkers that keep their vision focused forward and protect their eyes from dirt and mud. Polo horses have goggles and visors to protect their eyes from polo sticks and flying balls during play. Chariot racehorses also have protective eye wear to keep dirt and mud. What Are the Glasses Horses Wear? Why Do Horses Wear Blindfolds?